The PC Racing Flo Oil Filter is a beautifully machined billet aluminum case with a reusable stainless mesh filter. The filter is claimed to have 200% more filter capacity than disposable media types and it allows the owner to see the residue to check for problems. 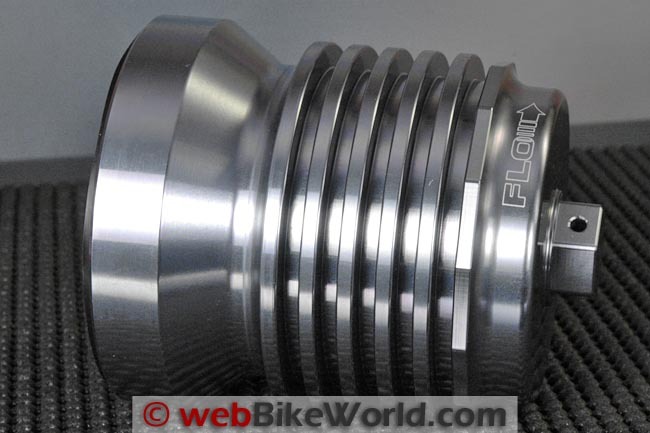 The spin-on Flo Oil Filer case has machined fins to adds some oil cooling efficiency. 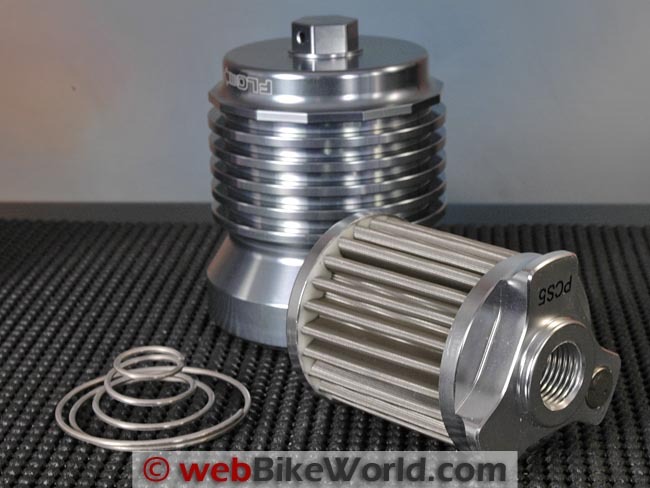 A drop-in stainless steel mesh filter version is also available and the system will fit many different motorcycle makes and models. We’re about to get into what is — but shouldn’t be — one of the most controversial subjects in all of motorcycling: oil! Not oil per se, but oil filters, a top that probably has as many forum threads as, ummm — let me guess: tires or chain lube? But I’m not going to waste time arguing one way or another; I’m only here to tell you about the Flo Oil Filter. We have received many emails asking about stainless steel reusable oil filters. But other than a brief mention in the Editor’s article about magnetic drain plugs and oil filter magnets, we haven’t done a reusable stainless steel oil filter review. There are several brands or types available, but the PC Racing Flo Oil Filter is very popular. Rick picked this one up at the 2012 Dealer Expo (report) at a show discount. We installed it recently in the Multistrada 620 “test mule” and this is my report. Components of the Flo Stainless Steel Oil Filter. 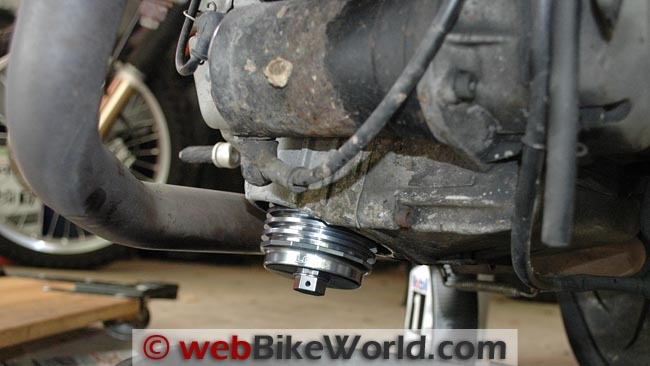 Why a Reusable Oil Filter? On the last day of the Dealer Expo, many of the booths have blowout sales on all of their demo products, which saves the staff from having to pack up the stuff and schlep it back home. At a list price of $119.95, the Flo Oil Filter represents a fairly hefty initial outlay, but Flo Oil Filters can be found discounted to $92 and they were half price at the show — a deal too good to resist. They just happened to have a Ducati filter on hand (stock number PCS5), so Rick grabbed it, forked over the cash and here we are. Now while 120 bucks for an oil filter may seem like a lot of dosh at first glance, it really isn’t once you start to think about it. For example, a good K&N or Wix motorcycle oil filter can cost anywhere from around $10 to $15 or more at discount and you’ll pay even more at the local dealer to buy an OE filter. So depending on how many miles you pack on (and how much you paid for it), the Flo Oil Filter will pay for itself over time. It’s a matter of cash flow: pay now, or pay later. But there’s more to it than just the financials. 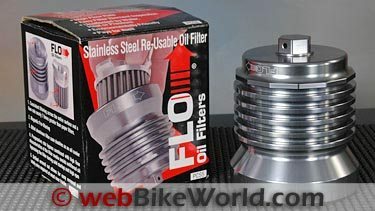 The Flo Oil Filter is (probably/surely/hopefully) better than any of those cheesy brand of throw-away filters you can buy. “Better”, in this case, means that it does a better job at filtering the oil, and that’s what it’s all about, right? Now of course I have no “scientific” proof that this is true; I can only go by what I’ve read. There may be some feel-good psychology here also, I’ll admit. You’re probably fine with your regular ol’ brand of disposable oil filter; after all, when’s the last time you heard of an oil filter failing? Sure, it happens, but if you’re careful and use decent quality components and brand-name oil — and make sure that the O-ring indeed comes out with the filter and isn’t stuck on the engine — you should be in good shape. 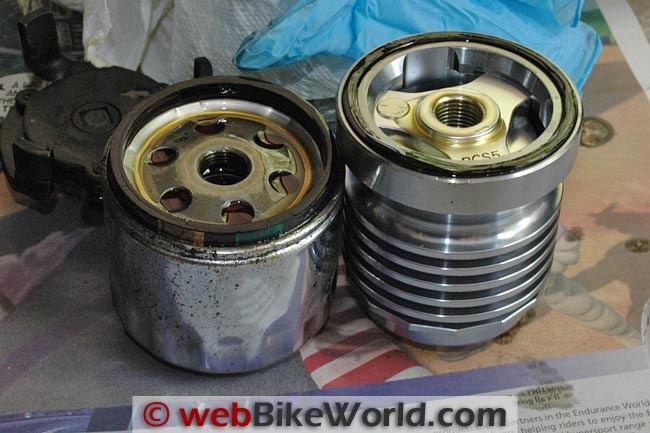 In fact (knock wood), I have never had an oil-filter related issue on any motorcycle I have ever owned…and I’ve owned plenty. Thus, a strong case can definitely be made that old-school tech is good enough. So be it — you won’t get an argument from me. But, there’s no getting around the fact that the Flo Oil Filter is one beautiful and serious piece of engineering. And it does have a few benefits you just don’t get from a disposable type. The main point of this article was to introduce readers to alternatives. Just for the record, we researched the Wix, K&N, Fram, Purolator, Flo and Scott websites during the course of developing the article. As many others have found, good information on this topic was either non-existent, not reliable or biased. I can tell you this: I’ve been changing oil on cars and motorcycles since before there was a President named Kennedy and I’ve seen absolute junk paper/traditional oil filters — including some that came apart in my hands as soon as I took them out of the box. So like most issues, there are no absolutes, unfortunately. I’d rather have a stainless steel mesh filter than some of the junk that’s passed off as filters today — including some OE stuff. Just about every car and bike forum has horror stories about various brands of oil filters, so again, there’s no absolute unfortunately. And the issue of recycling is important; some localities do not allow used oil filters to be put into the waste stream. One more thing to consider: the cost of riding to the shop to buy an oil filter or the cost of shipping if ordered online must be added to the cost of an OE filter. In my case, the nearest Ducati dealer is 21 miles away. The Flo Oil Filter is available for many different motorcycle makes and models. 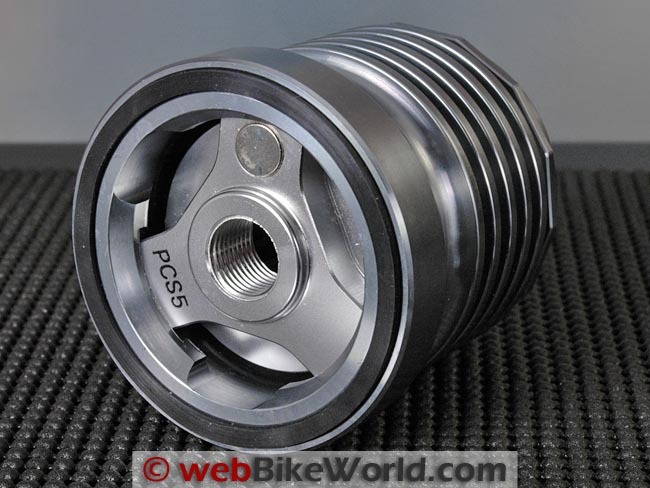 It comes as either a spin-on type with the filter inside the case, like the PCS5 shown here, or as a drop-in type, like the filter we now use in the Suzuki DR650 (blog) and described in the article about magnetic drain plugs and oil filter magnets. The drop-in type is pretty basic and looks like an OE oil filter cartridge but with the stainless steel mesh as the filter media, rather than the typical filtering media. PC Racing claims that the filter has 200% more filter area than a typical filter, along with a flow rate up to 7 times higher. One micron is a millionth of a meter, or 1/25,400 of an inch. 30 microns is about the size of maybe your typical speck of dust or a mold spore. A grain of sand is about 100 to 2,000 microns. The key point here is that the stainless steel media filters down to this size consistently across the entire surface area. Mass-market motorcycle filters are mostly unrated, because of the way they’re constructed, with all sorts of holes and passageways through the media that are not consistently sized or shaped at all. Now I have seen synthetic media (non-automotive) filters that filter down to a claimed 0.8 microns in size, but you also have to consider the pressures and viscosity of motorcycle oil. I doubt very much that an 0.8 micron (or anything close) filter will hold when a motorcycle full of 20W50 is started up on a 40-degree morning! UPDATE: Many traditional filter manufacturers either make no claims for the particle filtration size in microns. Also, there are “single pass” claims (filtering oil with one pass through the media) and “multiple pass” claims (more than one pass through the media). We checked the K&N website (no claims); Wix filters (claim 25 microns) and Fram (20 microns with multiple pass). Other sources say that any manufacturer’s claims may be suspect. Also, there are several factors to consider, including the filter capacity, the total amount of contaminants trapped between oil changes, oil pressure differentials at varying speeds and temperatures and more. So oil filter performance seems to be based on more than just a claimed particle filtration size. “The FLO Oil Filters are rated on an absolute (1 pass) system. Because of the inconsistencies of paper, they are rated on a multi pass system that allows particles 3 times the rated size (i.e. 60 microns) to pass once. The Flo Oil Filter has a built-in nickel-plated neodymium rare earth magnet. You can see the magnet; it’s the circular part on the upper arm inside the filter body in the photo above. The filter also uses a square O-ring instead of round. A square profile O-ring puts a lot more surface area in contact with the machined or ground sealing surface on the engine for better leak and blowout protection. The square O-ring that comes with the Flo Oil Filter is reusable many times. A spare comes in the box with the filter and more can be purchased if desired. More bonus features include the heavy fins that are machined into the outside diameter of the billet case. These help cool the oil; how much, I don’t know, but we have noticed what appears to be a few degrees lower average temperatures when riding the Multistrada 620, which does not have an oil cooler (but does have a built-in digital oil temperature gauge). Let’s see…more features include the machined-on hex nut at the bottom of the filter case (pre-drilled for safety wire), which means you’ll always be able to remove the filter (following correct toque specs is the best medicine here). And a second set of flats have been machined on the first cooling fin above the nut, just in case and to fit standard oil filter wrench sizes. A reusable filter eliminates oily cartridge filters or canisters to dispose of in the local landfill. In fact, it is illegal to dispose of used oil filters in some localities; check with your local recycling center to learn about the local rules. Heavy cooling fins machined into the outer case of the Flo Stainless Steel Oil Filter. Wix accessory Ducati spin-on oil filter on the left; Flo reusable oil filter on the right. Standard oil filter hanging out of the bottom of the Multistrada 620 engine. The Flo Stainless Steel Oil Filter sticks out farther but helps cool the oil. We had no problems fitting the Flo Oil Filter as a direct spin-on replacement for the Ducati Multistrada 620 filter (report). The Multistrada has seen everything from OE Ducati oil filters to Wix filters to no-name brands, one of which was chrome-plated. The original equipment oil filter doesn’t stick out very far from the recessed housing underneath the Multistrada’s engine. So it was sometimes (almost always) difficult to remove, especially if an over-zealous shop mechanic screwed it on with too much torque. Also, with any oil filter, it’s always very important to make sure the rubber O-rings and/or gaskets come out with the filter. I can’t count how many times I’ve had to fish around inside an oil filter recessed chamber with a pick to pull out an old O-ring. This seems to be a very common issue with the aftermarket Ducati oil filter brands, for some reason. The Flo Oil Filter spins on and the square O-ring feels like it seats better, although again, it’s important to make sure it comes out with the filter next time. The key is to not over-tighten; pretty much with any O-ring, once it’s compressed a little bit (to about 30%), there’s no need to tighten any more and, in fact, more torque may not be better. You don’t want to squish the O-ring, which can twist it and let oil through. And, sometimes the compression from the O-ring is what puts back pressure on the threads to keep the filter body from unscrewing. Tighten it too much and you may lose this spring-like pressure. The only other difference is that the Flo Oil Filter does protrude farther out than the stock filter. 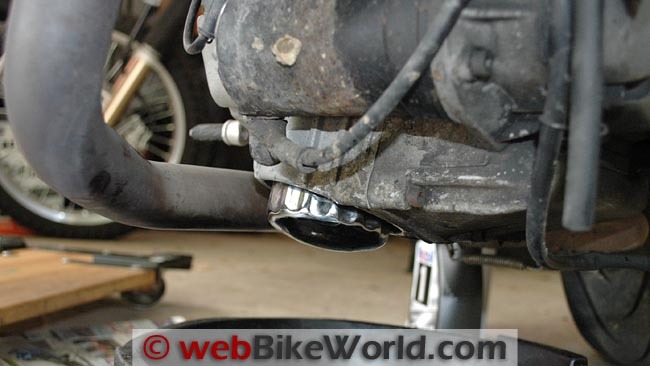 This may be an issue on some bikes that will go off-road. The flip side is that the extra length helps get those cooling fins out in the airstream, which probably help with some oil cooling. One other real bonus is that you don’t “change” the filter; the filter is reused instead. Unscrew the filter body and the inner filter comes out by pushing down and twisting — a spring (shown in the first photo above) keeps the pressure on the filter media to keep it in place. Pull the stainless steel filter media out and you’ll see if there are any metal flecks or bits or whatever in the oil — something you never see when you use a replaceable/disposable filter (unless you cut it apart, and who does that?). Clean out the filter housing and clean the mesh with kerosene or solvent (PC Racing recommends not using gasoline) and you’re all set, ready to replace it. You never have to worry about having a filter canister on hand and being able to see inside and clean it out is very handy indeed. We’re sold on the PC Racing Flo Oil Filter. Yep, it’s expensive — or at least the initial outlay is — but you’ll pay it back and, in theory anyway, have cleaner and cooler oil. The machining and build quality of this device is outstanding; it is truly a work of art! UPDATE (November 2012): The December 2012 edition of Motorcycle Consumer News has an interesting one-page review of the K&P Engineering High Performance Micronic Oil Filter, which looks identical to the Flo filter shown in this review. Their conclusion is nearly identical to ours; that is, that paper filters can let much bigger particles flow through, even though they typically list the smallest particles that the filter media catches. Their list of benefits is also nearly identical to our findings in this review, which further supports our opinion regarding the benfits of reusable stainless steel filter technology. Colors: N/A. Made In: U.S.A.
From “J.H.” (June 2017): “4-5 oil changes later, I never cleaned the outside of the PCS1 filter until I took those pictures (below). It had tar, grit and other crap, it’s been exposed to salt/freezing snow too. First oil change I was alarmed when I saw metal debris in the oil pan on a bike who’s engine is 19,000 miles old. The problem stopped happening later on after several oil changes had flushed whatever was going on out of the system. I suspect the filter element had some metal stuff loose in it over time. Filter seems flawless now, I am a bit annoyed they GLUED the filter in place instead of using more reliable methods that are not subject to deterioration from heat and oil. At the time of this pic I am now closing in on 40,000. My Honda bike has 2 filters to change every time, an engine oil filter 10-15 dollars, and a clutch filter which is 5-10 dollars. Dirty PCS1 oil filter off the bike. PCS1 oil filter internals, before cleaning. Messy glue holds the filter screen to the filter body? Cleaned PCS1 oil filter ready for re-installation. That fails to take into account the costs of increased engine wear if the OEM filters don’t work as well as the reusable types. 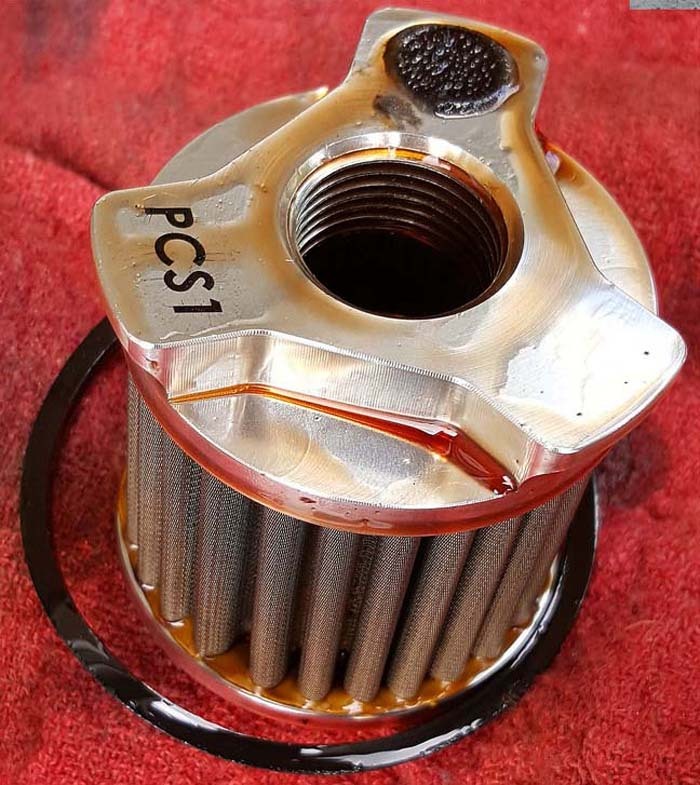 Editor’s Note: One other thing that must be added to the equation is the cost of driving/riding back and forth to the dealer to buy an OE filter, or the cost of shipping if purchased online. As noted in the article, it brings the price of a single OE filter closer to $25.00 for me. From “M.P.” (May 2012): “Looks like you opened a can of worms. Funny reading the comments, most of the commenters never tried the filter actually but they seem to have a lot to say about it. I work at an industrial stationary engine retailer and we heavy industrial equipment along with farm and construction tractors also (S. Africa). Stainless steel replaceable filters are nothing new — they have been used for years in industry. So the idea may be new for motorbiking, and it will take people time to get used to the new technologies. I can tell you that if you ever took a cruise ship or stayed in a big hotel, all of the water was probably filtered through stainless filters. It’s a must because of the pressure issue as you brought up. The stainless filter media consistently works under much higher pressures, which can occur as the media gets plugged. But here’s the most important thing not realised: the industrial powerplants we sell also use a wet clutch, just like many motorcycles. The clutch plate material is bathed in oil — that’s right, the same oil that lubricates/cools the engine. So think about it — as the clutch gets worn, those fibers/particles get into the oil. It must be filtered and I can tell you that the paper filters will pass much larger particles, then get quickly plugged up. We run tests all the time on this to check it. In fact, stainless steel oil filters are sold by the manufacturers as accessories for these engines, and we always recommend the customer buys one for longer life. The filters hold up better under pressure and when they get dirty (and they’re easier to change). As someone mentioned, the paper filter’s are usually rated at only the smallest particle they filtered — they don’t tell you the biggest particle size. The stainless filter media may not (yet) filter down to the smallest size, but like it says in the article, they are consistent, always filtering at a standard size. They will not let those bigger particles through as EVERY paper or synthetic media will. From “J.L.W.” (May 2012): “Sorry guys, I’m not buying (pun intended). At $92 a pop I could buy six $15 filters. From “L.B.” (May 2012): “Reading the comments, looks like you hit on a subject with more controversy than those oil threads. We have used stainless reusable oil filters for years in our diesel and gas work truck fleet, industrial equipment and dozers. It saves thousands. We test the oil all the time to figure out when to change it and the stainless filters work, no doubts. The two reasons reusable filters are better are that they filter the oil consistently (key word) under every condition. Disposable filters will pass all different size particles through the filter, we found up to 200 microns. The stainless filters stay the same under all conditions, all pressures. You’re right in saying that the normal filter companies will only tell you what the minimum size particle is, they don’t tell you how many times through the filter it takes before the particles are caught either. Also, because they flow so much more oil, the bypass in the stainless filters is almost never used, thus more oil is filtered compared to most disposables, which bypass the oil on startup and you get NO filtration. From “C.T.” (May 2012): “I’ve been using stainless mesh filters since they came out and I have no issues. I even sent the oil in once to a lab to compare and there was no difference between the original filter and stainless. From “R.C.” (May 2012): “Cleanable re-usable Stainless Steel oil filter is nice it’s also a dream to think that this type of media will offer the same level of protection as the more common oil filter media found in the industry which is cellulose, synthetic or a bland of cellulose/synthetic. Flo is not the first manufacturer/marketer of such type of filter and from my filtration experience (29 years) many people found out the hard way that such filter will result in a shorter life of an engine. The use of such filter will not cause any problem short term but will leave damaging size contaminants (15 to 25 microns) do their work and result in a shortened engine useful life. They claim that this type of filter capture items down to 35 microns but they never state the efficiency. They rave on to say that it is 3 times better then paper or brass media. It might capture items down to 35 microns like a window screen but without tested efficiency rating that figure is meaningless. I had a customer who use similar built filters on their fleet of Highway Tractors running Detroit Diesel Series 60 Engine. They ran them on their 6 trucks and everything was fine for the first 6 months (~70,000 KM or 42,000 miles) and the engine started to burn oil then they had two engine failures. 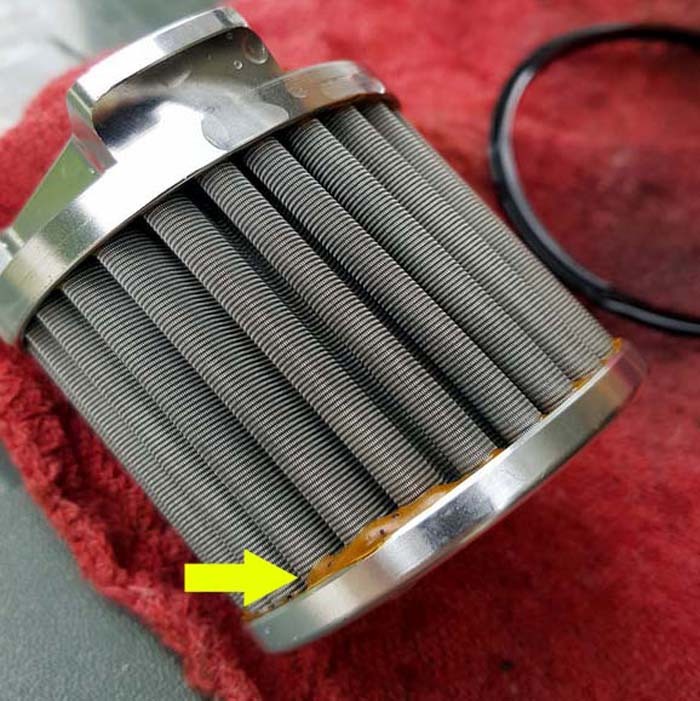 After the analysis by the local Detroit Diesel authorized service depot, they concluded that the filters where not providing the proper level of protection. They left contaminants run in the engine which cause abnormal wear on the internal engine components (Crankshaft Bearings, Camshaft Bearings, Piston rings) and they voided the warranty because of the lack of efficiency of those type of filters. The manufacturer of these cleanable filter did offer a warranty but when came time to collect they were under Chapter 11 and never got out of it. As the saying goes, you can use whatever you want on your equipment but it is your responsibility to make sure that what you use meet the manufacturer’s specification. Using these type of products, you are condemning you engine to a slow death. My 2 cents, if you have your engines that much, go ahead and use these type of products. If you want to save even more, do not bother with oil or/and oil filter changes. FYI, the reason that manufacturers do not have any specifications in their applications guides and website is that they do not want to start a number war without any laboratory test results. Editor’s Reply: Unfortunately, it’s not possible to trust most of the data from the traditional oil filter manufacturers either. They quote the smallest micron size filtered without mentioning the largest; don’t say what test was used; quote single pass numbers only, etc. In the end, you can’t go wrong by using the recommendations for oil type and filter listed in the owner’s manual. From “B.L.” (May 2012): “I would like to address two points you made in this article. The first concerns the landfill comment about disposable oil filters. In Minnesota, it is illegal to dispose of oil filters in the garbage; they must be legally recycled (they are accepted by the same places which accept used oil). I would assume this is a federal law, not a Minnesota state law — the EPA has long reach, these days. Secondly, you commented on the poor flow rate on 40-degree mornings, due to the oil being particularly thick at this temperature, and how the stainless steel filter should allow better bypass abilities with its progressive spring mechanism. This issue can be greatly reduced, or possibly eliminated, by using a wider range viscosity oil. There are several available with 0W-40 Mobil 1 Full Synthetic being the widest range oil I’ve found yet (incidentally, it has no energy star markings, so it should be safe for wet clutches). Another oil readily available, without the energy star marking (rated API SN, for cars), is Shell Rotella T6 Synthetic 5W-40. I know from first-hand experience that the Shell product delivers on the promised 5W in winter. I run it in my car, which sits in an open parking ramp. After sitting all day, the engine spins over at 5:00 PM, just like it were an 80-degree, July day, when in reality, the air temperature is sub-zero Fahrenheit! I run this oil in all of my engines: truck, car, motorcycles, lawn mowers, snow blower. And my air compressor (needed to use it last winter, but it would not turn over with straight 30 weight oil; changed it to 5W-40, and ran it like it was a warm summer day — change it regularly, and the lack of filtration with a detergent oil is not a concern). From “L” (May 2012): “Just wondering why one would want to use a 35 micron filter when paper filters are tested at 20 microns per the ISO standards. I can see the use of a stainless cleanable filter in a racing application where the prime concern is likely flow rate and it might be useful to look for metal and such in the filter but for a street application why bother? If you did find some metal flakes in the filter what would you do with that information, except worry about it? In the old days it was not too unusual to find some small metal flakes in the oil of a new engine but I think they leave the factory cleaner these days? I guess over the long haul you might save a few bucks on a re-useable filter but seems like a lot of work for the savings? Editor’s Reply: The filter media is easy to clean with solvent or soap and water. The other advantages of a reusable filter are listed in the article. It’s claimed that traditional (i.e., paper or synthetic media) filters don’t have a consistent filtration across the entire media, unlike stainless steel. Also, many oil filter manufacturers make no claims as to the size of the filtered particles and how there are different methods of arriving at the numbers. We asked PC Racing for more information comparing the Flo Oil Filter to others and are awaiting a reply. From “T.G.” (May 2012): “My only concern is how do you effectively clean this filter? The only way I know of cleaning a reusable filter is to reverse flow it to release the trapped particles, and I can not see a way of effectively reversing the flow on this. I worry about the filter slowly reducing it’s flow capabilities over time, but I do like the inspection ability. I was a big fan of the old Yamaha filter that you replaced the exposed element in its housing. Yes a lot of people hated it, but I got to see what was on the filter paper. Today I use an automotive oil filter cutter on every oil filter. Race car mechanics use them to inspect the filters, and today’s bikes essentially are running car oil filters so it works great. Lastly I really like the magnet built into the reusable filter, but today’s bikes have a lot more aluminum in them than steel so you have to look at the filter closer to see the metal shavings. Editor’s Reply: The filter is pretty easy to clean by holding it over a container or disposal container and clean with kerosene or spray solvent. Be sure to wear protective gloves when doing this. It’s unlikely that the stainless steel mesh will lose its effectiveness over time. 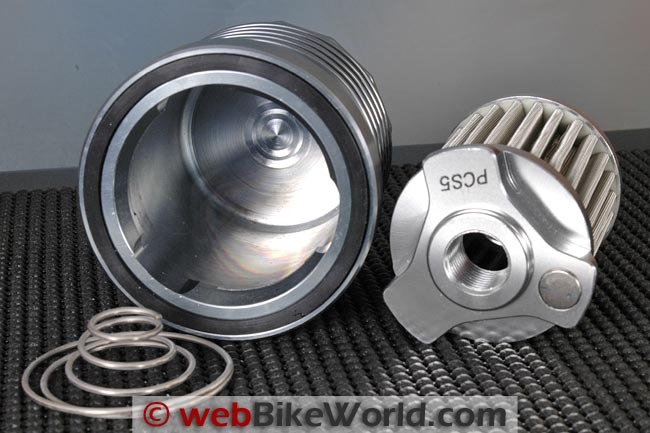 From “M.M.” (May 2012): “I’ve used a Scott Performance stainless steel filter on my 2003 BMW K1200GT since I purchased the bike in 2004. BMW oil filters run at that time $26.00 for what they called a kit (filter, seals). 7 oil changes at least, I paid $135 delivered, yes it was worth it. 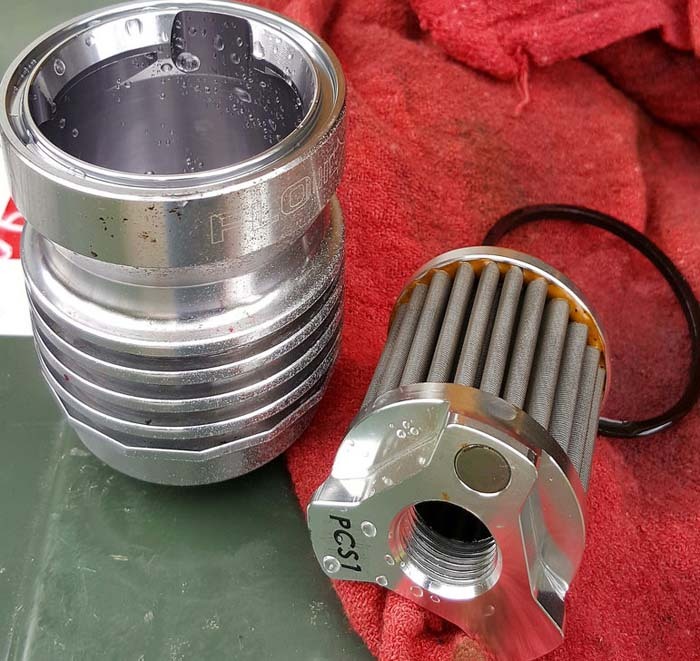 Editor’s Reply: Here’s a quick look at a Scott stainless steel oil filter on the Suzuki DR650, it appears to be very similar to the drop-in Flo oil filter cartridge type.